1. Vanilla coffee sugar scrub cubes are incredibly easy to make and perfect for one time use. 2. Adding coffee grounds to the soil changes its PH, which turns hydrangeas’ blooms to blue. 3. Scrub dirt off your metallic pans using old coffee grounds and some dish soap on a rag. 4. Make a banana coffee foot scrub to take advantage of coffee’s exfoliating properties. 5. Adding coffee grounds to shampoo removes buildup from your hair, and it can also darken its hue. 6. Unclog the sink or bathroom drain by pouring down used coffee grounds, followed by few drops of dish soap and a pot of boiling water. 7. Fight fine lines on your face with this coffee-infused eye cream. 8. Place used coffee grounds in the fridge to remove unpleasant odors. 9. Dye fabric or paper with coffee to get a chic, vintage look. Here’s how. 10. Toss your coffee grounds into the fireplace to help clean it. It will also keep the ashes from flying out. 11. Put those grounds to some good use with this recipe for exfoliating homemade coffee soap. 12. The nitrogen in coffee grounds makes for a great compost for your garden. 13. Make a refreshing face wash using coffee grounds, sugar and coconut oil. 14. Make an air freshener using just coffee grounds and a stocking. 15. 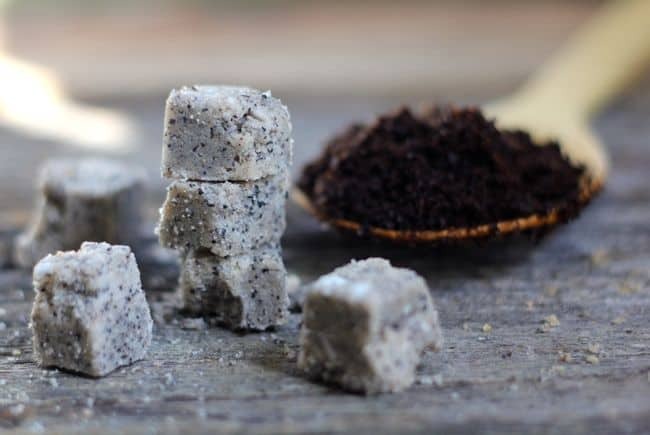 Coffee is great against cellulite, so make these coconut coffee scrub cubes for your skin to enjoy. 16. Dye Easter eggs naturally, using coffee and vinegar. 17. Coffee adds a deep, earthy flavor to meat. Try these coffee-rubbed ribs. 18. That bag of coffee from the pantry that’s older than you can remember? Turn it into French vanilla candles. 19. Make bread look darker by adding some coffee to the dough. 20. Mask scratches in wood (especially dark) with some oil and coffee grounds. 21. Plant small herbs inside for a pretty eggshell garden. 22. Smash eggshells into a powder and mix with egg white before using as a face mask. 23. For itchy skin, place an eggshell into some apple cider vinegar and soak for a few days. The mixture helps small irritations as well. 24. Bake eggshells at 350 degrees for 8 minutes. Grind them to a fine powder and add one teaspoon to your daily smoothie to supplement your calcium intake. 25. Make chalk from eggshells in any color you like! 26. Eggshells are abrasive, so use them to clean pots, pants and other tough areas from the house. 27. Make cupcakes inside blown out eggshells. They look spectacular! 28. Pour wax into eggshells to get lovely candles. 29. Make a beautiful eggshell mobile for the little one. 30. In a mason jar, place some eggshells and cover with water. Use to water indoor plants. 31. Make a beautiful DIY mosaic bracelet. 32. 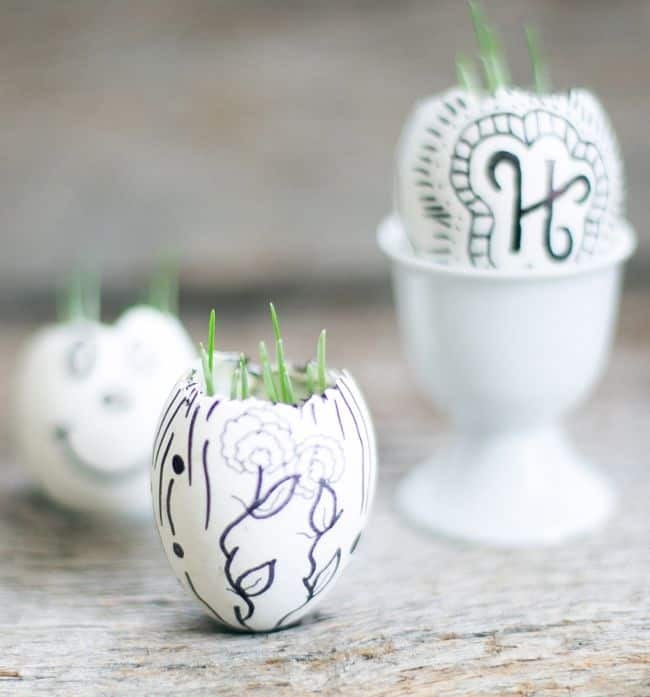 Eggshells are not just for Easter – make these cute ghosts for Halloween. 33. Place a few eggshells in the kitchen sink strainer. They help trap solids, but also clean the pipes as they break down in time. 34. Throw in eggshells (in a closed fabric bag) in the wash to help your white regain whiteness. 35. Sprinkle smashed eggshell over a stain, add some warm water, and see how the stain is being absorbed. 36. Scare away slugs, snails or cutworms by scattering crushed eggshells around the garden. 37. Make chocolate eggs inside eggshells – perfect for Easter and beyond. 38. The calcium and minerals in eggshells are great for your garden as well, so they can easily be used in compost. 39. Use leftover eggshells from Easter to create pretty mosaic picture frames with the kids. 40. Make nourishing eggshell water that’s rich in calcium and minerals. 41. Use the inside of banana peels to polish your shoes quickly. 42. Soothe an itch or poison ivy rash by applying banana peels. 43. Bury small pieces of banana peels at the base of your roses to get beautiful, healthy blooms. 44. 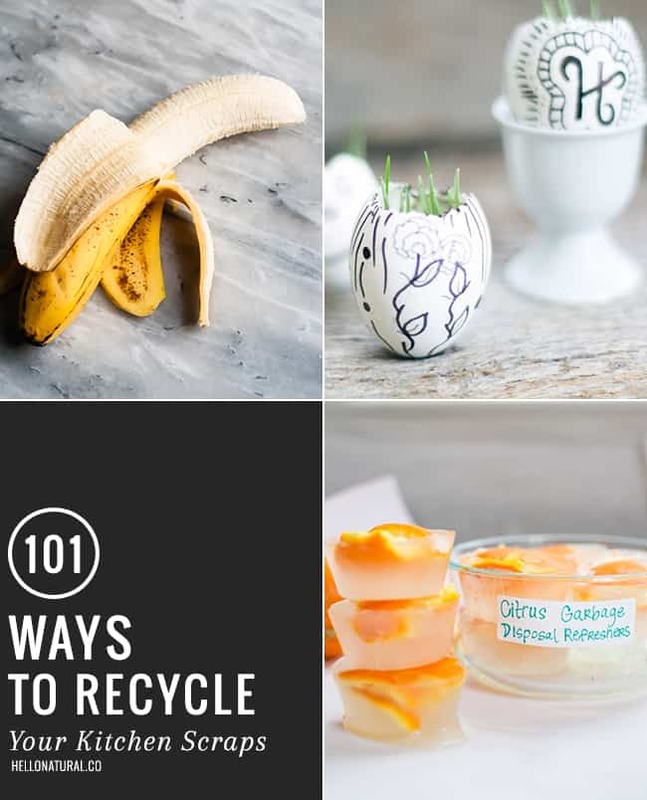 Blend banana peels with some water to rub away tarnish off of silverware. 45. The manganese, magnesium and potassium in banana peels whitens the enamel of teeth. Just rub your teeth with the inside of a banana peel. 46. Avocados will ripe faster is you place them in a paper bag with ripe banana peels. 47. Get rid of aphid pests by burying chopped up peels 1-2 inches in the soil of plants. 48. Feed rabbits, chickens or pigs with banana peels (just make sure they’re pesticide free). 49. The potassium in the banana peel helps cure warts. Just rub banana peel on it every night and you will see the results in two weeks. 50. 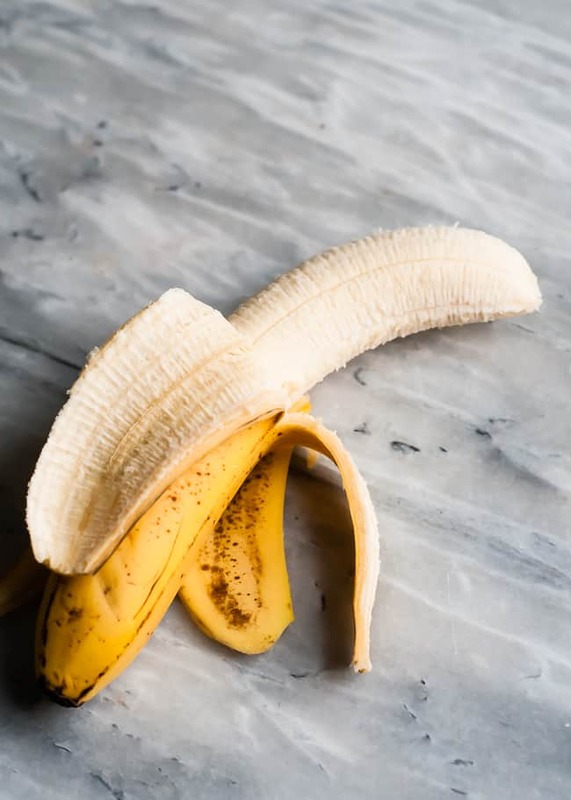 Rub the inside of a banana on a bruise to make it disappear faster. 51. Rub the inside of a banana peel on psoriasis-affected areas twice a day to help dry skin dissipate. 52. Give your plants a healthy glow by rubbing their leaves with the inside of a banana peel. This will also remove dust or debris. 53. Make sure your steak is tender by adding a banana peel to your roast. It will add just enough moisture. 54. Dry up banana peels and grind them, incorporating the powder into the soil in your garden. 55. Rub banana peels on your acne to help it cure faster. 56. The potassium and phosphorus in banana peels makes them the perfect compost. 57. Write a secret message on a banana for your kids to enjoy at lunch. 58. Improve your complexion by massaging ripe banana peel over your face once every few days. It exfoliates and nourishes the skin. 59. Make banana peel vinegar, which is slightly sweet and tastes great on salads. 60. Juice clean banana peels and throw them into your smoothie to ease depression and benefit the eyes. 61. 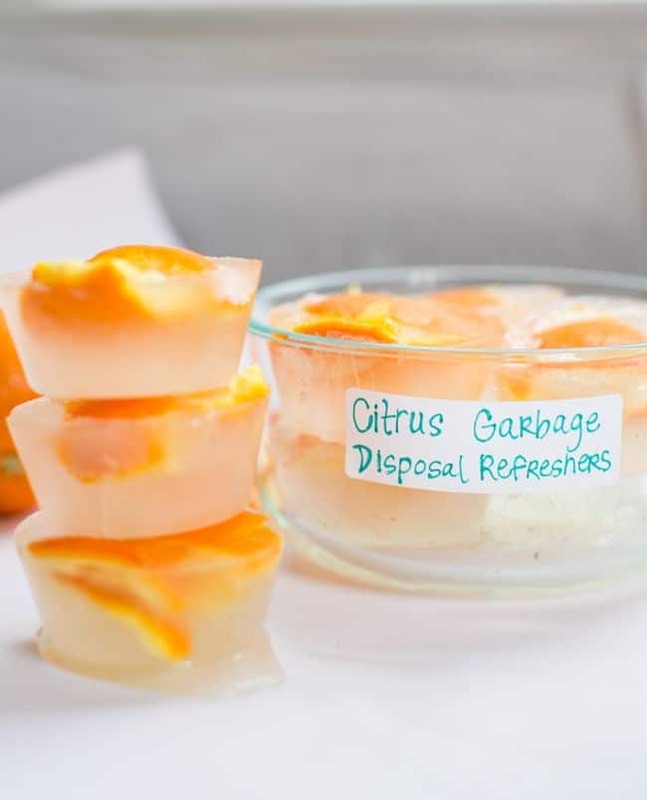 Refresh your garbage disposal with this DIY citrus refresher. 62. Make candied orange peel, one of the most delicious snacks in winter. 63. Take it to the next level with chocolate covered candied orange peel. 64. Remove water stains from your metal fixtures by rubbing with orange peel. 65. Before they’re dried completely, orange peels make a great sponge. They also leave a nice, citrus scent. 66. Make a botanical cologne with orange peel, mint leaves, essential oils and vodka. 67. Make a floor and window cleaner by mixing orange peels with apple cider vinegar. Let it sit in the fridge for a few weeks before using. 68. Use candied orange peel to bake a delicious festive sweet bread. 69. Dry orange peels in a sachet and place in smelly shoes to absorb the odor. 70. Use orange halves to make DIY citrus candles. 71. Rub your nails with orange peel to give them some shine. 72. Dry the orange peels and mix them with some herbs for a natural scented firestarter. 73. Get rid of dandruff by using a mix of grinded orange peel and water overnight. 74. Chew an orange peel instead of gum to get instant fresh breath. 75. Grind orange peel into a paste and use on your face to get rid of acne and excess sebum. 76. Make a delicious tea with orange peels, breakfast tea and cardamom. 77. Place orange peels in cupboards to keep away spiders and other pests. 78. Flame orange peels to garnish a matching cocktail. 79. Make orange extract at home, with vodka and boiling water. 80. Make Chinese orange peel chicken, a tasty comfort food that doesn’t let you waste those peels. 81. Paint your tin cans in a trendy color and turn them into desk organizers. 82. Make romantic Valentine’s Day votives. 83. Make a Christmas tree out of different sized cans. 84. Store screws and nails. 85. Make a piggy bank for the kids. 86. Use as an ice bucket for summer gatherings with more than one table. 87. Turn into a mini grill for camping. 88. Store your kitchen utensils where you can see them. 89. Make a colorful wind chime out of several tin cans. The kids will love it! 90. Use the cans as planters to embellish the fence in your backyard. 91. Make a rustic bird feeder with a tin can and rope. 92. Cover in craft paper for these wonderful picnic place settings. 93. This pop-top herb garden is a wonderful gift for any green friend. 94. Clean thoroughly and use as molds to bake individual cakes in. 95. Paint a can and a plate in the same color, then glue together for an impressive cake stand. 96. Customize the tin cans on a wedding car with pretty messages. 97. Decorate with twine and turn into planters for your cacti. 98. Use smaller tins as round cookie cutters. 99. Make a tin can lamp for summer evenings on the porch. 100. Turn your cans into chic pop art vases. I wouldn’t use cans to bake in since they have a toxic coated lining. This post is filled with useful tips that I’d like to try! I have a question about your tips “#5. Adding coffee grounds to shampoo removes buildup from your hair, and it can also darken its hue.” Are you referring to unused or used coffee grounds? I’m sure you could use either, but unused would probably be the most potent.